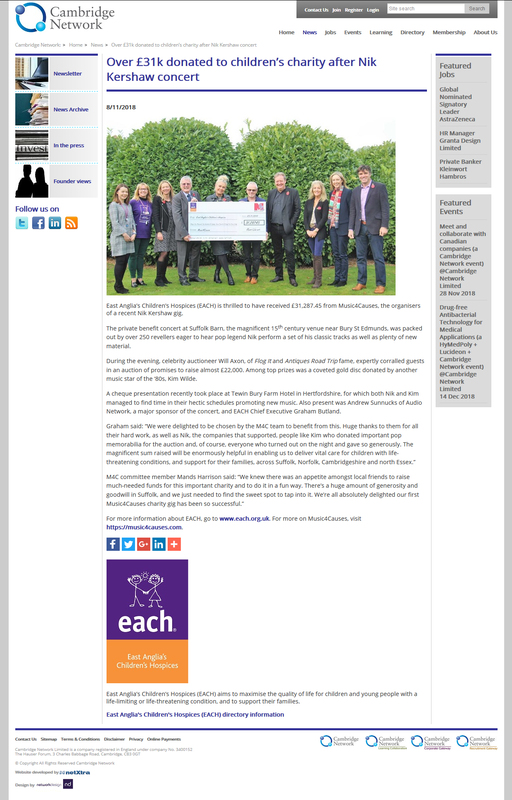 East Anglia’s Children’s Hospices (EACH) is thrilled to have received £31,287.45 from Music4Causes, the organisers of a recent Nik Kershaw gig. The private benefit concert at Suffolk Barn, the magnificent 15th century venue near Bury St Edmunds, was packed out by over 250 revellers eager to hear pop legend Nik perform a set of his classic tracks as well as plenty of new material. During the evening, celebrity auctioneer Will Axon, of Flog It and Antiques Road Trip fame, expertly corralled guests in an auction of promises to raise almost £22,000. Among top prizes was a coveted gold disc donated by another music star of the ‘80s, Kim Wilde. A cheque presentation recently took place at Tewin Bury Farm Hotel in Hertfordshire, for which both Nik and Kim managed to find time in their hectic schedules promoting new music. Also present was Andrew Sunnucks of Audio Network, a major sponsor of the concert, and EACH Chief Executive Graham Butland. For more information about EACH, go to www.each.org.uk. For more on Music4Causes, visit https://music4causes.com.